Rossen Gergov is gaining widespread recognition for his work both on the concert platform and in the opera pit, in repertoire ranging from Mozart to the most challenging of contemporary works. He held the position of Chief Conductor of the Bulgarian National Radio Symphony Orchestra until last season. This season he debuts with the Noord Nederlands Orkest and the Sofia Philharmonic Orchestra, as well as returning to the SWR Symphonieorchester as part of their subscription series. Recent highlights include returns to Ensemble Modern, Orchestra Sinfonica Siciliana, I Pomeriggi Musicali and debuts with Orquestra Sinfônica de Porto Alegre, Deutsches Symphonie-Orchester Berlin, and the Slovak Radio Symphony Orchestra. Born in 1981, Rossen studied piano and clarinet before taking conducting lessons with Michail Angelov and subsequently studied with Leopold Hager and Seiji Ozawa. He conducted the ORF-Sinfonieorchester upon graduation and went on to become Assistant Conductor of the Tonkünstlerorchester Niederösterreich, a post he held until 2009. 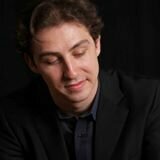 Rossen Gergov is a Laureate of the first Evgeny Svetlanov International Conducting Competition in 2007. His recording of works by David Chesky with the Symphony Orchestra of Norrlandsoperan was nominated for a Grammy in 2008 and he has also recorded for the BBC, Bayerische Rundfunk and ORF in Austria.